Our Staff. Our Stories. Our Journeys. This is why we do what we do. And why we love what we do. ​I started working in the traditional medical field over 20 years ago and felt that something was missing. We were treating parts of the person but not the whole person. This experience led me down the path to holistic health. I became very interested in the mind body connection and wanted to learn more! My desire to learn lead me to study several different healing modalities including massage, Reiki, crystal therapy and hypnosis. I was the owner and operator of Minds Eye Hypnosis in Greenville, De and the focus of my practice was on past life regression, Reiki, and crystal therapy. My desire to learn has not stopped! Over the past year I studied sound healing at The Sage Academy of Sound Energy In Woodstock, NY and became a certified sound healing practitioner. By using instruments such as Himalayan singing bows, crystal singing bowls, chimes, bells, drums and gongs to name a few…I am able to help the client reach a deep level of relaxation. The vibrations from the various instruments help “tune” the body. Sound sessions can be done one on one or in a group setting. It is truly something to experience! I have coached and trained at Jack’s kickboxing Gym and Blackfeather Muay Thai. 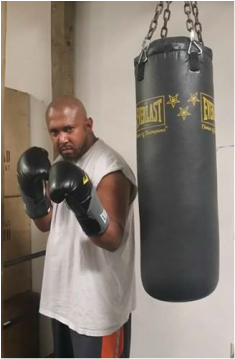 I have written and am currently writing articles for Doghouse boxing (you can find me under “Zito Doghouse Boxing”) and I currently co-host a Blog talk show, Fightin’ Words Blog Talk Radio Show. I work with students just beginning in their boxing training as well as very experienced students. Come try a class, whether you’re looking to advance your boxing training or you’re looking for a great physical workout. See you in the gym. ​​Solymar is passionate about helping others. This passion and her ability to aid others in relaxing led her to pursue her career in massage therapy. She graduated from the Academy of Massage and Bodywork in December 2016. Solymar is a member of the ABMP Massage Association. Her specialties include hot stone therapy, Swedish relaxation massage, prenatal massage, deep tissue techniques, trigger point therapy and aromatherapy. Solymar is continuing her education in subtle energy techniques and is excited to add them to her modalities soon. She intentionally customizes every massage session to fit your individual needs. Her nurturing approach provides a combination of therapeutic relief, relaxation and great energy! I am dedicated to pain relief/management. Short-term chronic pain from workouts, sports, bad posture, or sleeping wrong. Long-term chronic pain from conditions like fibromyalgia, joint replacements, and overuse. I've been a full-time massage therapist since 2005 and an Esthetician since 2011. Some of my advanced trainings include: medical massage, orthopedic, prenatal, lymphatic drainage, sports massage, Reiki, hot stone massage, Craniosacral Fascial Therapy, and pediatric CFT.My approach is to assess, identify, and treat my clients asked on their individual issues and goals. After an intake conversation, using deep engagement techniques that include joint mobilization, I identify which muscles are moving poorly, where adhesions are restricting range of motion, and how all of this contributes to discomfort. Having found areas where the body is not working optimally, I do the clinical massage required to remove the restrictions : trigger point work, myofascial techniques, sustained compression, deep tissue, etc. Marshal Manlove is a Certified Hypnotherapist through the American School of Hypnosis and founder of First State Hypnosis. He specializes in working with clients to reduce stress, enhance performance, quit smoking, and lose weight. Other concerns may also be addressed. Mr. Manlove also operates the American School of Hypnosis, Delmarva to teach and certify others to become hypnotists and work in this rewarding field. ​Kim is a graduate of Academy of Massage and Bodywork here in DE. ​I started down this path 4 years ago with Aromatherapy and never looked back. My love for Essential Oils lead me to Raindrop Technique training in August 2016 which brought me to my Reiki training in 2017 which lead me to becoming a Massage Therapist. My specialties include Swedish Massage, Aromatherapy Massage, Raindrop Technique, Reiki, Chakra Balancing, Ear Candling and Spa Therapies. It brings me great joy to introduce others to the benefits of Massage and all the wonderful energy techniques I have studied these past few years.